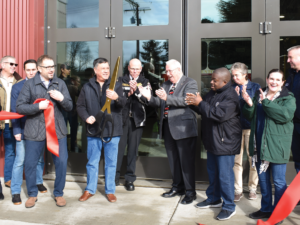 Renton RFA responded to 1,541 incidents during the month of January 2019. Below are details on the most significant incidents that occurred throughout the month. On 1/11/19 Renton RFA responded to a cooking fire in Station 11’s area at the 50 block of Burnett Ave in Downtown Renton. We responded in conjunction with Skyway FD and Tukwila FD with 4 engines, 1 ladder truck, 1 aid car and 2 officer rigs for a total of 19 personnel from stations 11, 12, 14 and 15. The fire was a result of food being left unattended on the stove. There were no injuries from this fire and no one was displaced as a result of the fire. On 1/11/19 Renton RFA responded to a residential fire in Station 11’s area at the 3300 block of SE 5th We responded with 5 engines, 1 ladder truck and 2 officer rigs for a total of 20 personnel from stations 11, 12, 15, 16 and 17. The cause of the fire was undetermined at the time of the incident. But the fire was confined to an access crawl space. There were no injuries at the time of the fire and no one was displaced as a result of the fire. On 1/12/19 Renton RFA responded to a residential fire in Station 17’s area at the 14900 block of SE 179th St in Fairwood. We responded in conjunction with Maple Valley FD and Kent FD with 2 engines and 1 aid car for a total of 8 personnel from stations 13 and 17. The cause of the fire was a grease fire from cooking on the stove top. There were no firefighter injuries but the resident suffered from burns due to putting out the grease fire. No one was displaced as a result of the fire. On 1/16/19 Renton RFA responded to an out of jurisdiction building fire at the 11300 block of SE Kent-Kangley Rd in Kent. We responded with 1 officer rig for a total of 1 battalion chief from station 13. The battalion chief provided safety support during the fire suppression activities. 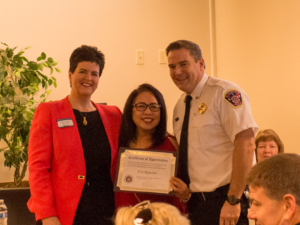 The cause of the fire was not determined at the time of the incident. There were no injuries as a result of the fire. On 1/19/19 Renton RFA responded to a building fire in Station 11’s area at the intersection of N 3rd St and Park Ave N. We responded in conjunction with King County Medic One with 2 engines, 1 ladder truck, 1 aid car and 1 officer rig for a total of 12 personnel from stations 11, 12 and 14. The fire occurred in a detached garage but the cause of the fire was undetermined at the time of the incident. There was one victim inside of the building that had to be forcibly removed for their own safety. The victim was seen by EMT’s and Paramedics then transported to Valley Medical Center. There were no firefighter injuries and no one was displaced as a result of the fire. On 1/19/19 Renton RFA responded to a commercial fire in Station 14’s area at the Walmart on the 700 block of Rainier Ave S. We responded in conjunction with Skyway FD and Tukwila FD with 2 engines, 1 ladder truck and 2 officer rigs for a total of 11 personnel from stations 11 and 14. The fire started out as a call reporting black smoke around the garden center and cosmetic section of the store. The sprinkler system was already activated upon our arrival. The entire store was filled with smoke from the fire but all employees were accounted with no injuries. And there were no customer injuries as a result of the incident. The cause of the fire is still under investigation. On 1/1/19 Renton RFA responded to a stabbing in Station 14’s area at the Walmart on the 700 block of Rainier Ave S in Downtown Renton. We responded in conjunction with Skyway FD and King County Medic One with 1 engine and 1 officer rig for a total of 4 personnel from station 14. There was one 22 year old male victim with multiple stab wounds. The stabbing was a result of an altercation and is currently being investigated by the police. 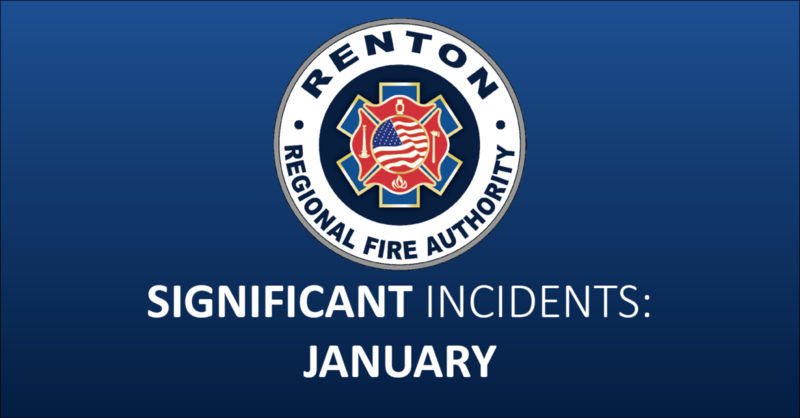 On 1/18/19 Renton RFA responded to a shooting in Station 11’s area at the 200 block of S 3rd St in Downtown Renton. We responded in conjunction with Skyway FD and King County Medic One with 1 engine and 2 officer rigs for a total of 5 personnel from station 11. The shooting victim was a 28 year old male whose car was stolen as a result of the shooting. The victim was transported to Harborview Medical Center for further medical treatment. The incident is under further investigation by the police. On 1/20/19 Renton RFA responded to a fatality shooting in Station 14’s area at the Walmart on the 700 block of Rainier Ave S. We responded in conjunction with Skyway FD and King County Medic One with 1 engine and 1 officer rig for a total of 4 personnel from station 14. The shooting victim was a 16 year old male. Resuscitation efforts were made but the victim did not survive. The cause of this incident is under investigation by the police. On 1/9/19 Renton RFA responded to a gasoline / flammable liquid spill in Station 11’s area at the intersection of N 4th St and Williams Ave N in Downtown Renton. 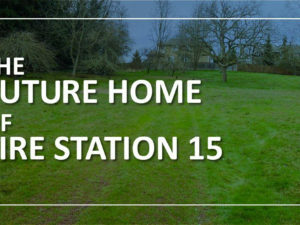 We responded in conjunction with Kent FD with 1 engine and 1 officer rig for a total of 4 personnel from station 15. 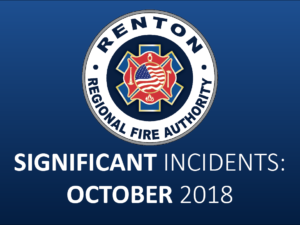 There was an odor at the intersection of N 4th St and Williams Ave N. Upon investigation it was discovered that the City of Renton performed a diesel spill clean-up earlier that day. It was determined the odor was from that earlier spill. On 1/12/19 Renton RFA responded to an out of jurisdiction swift water rescue at the 28900 block of Green River Rd SE in Kent. We responded with dive unit and 1 officer rig for a total of 6 personnel from station 12. The call was for a vehicle in the water. There were no occupants in the vehicle. And the vehicle was safely towed out of the water.